Many outlets are reporting that Julian Assange is facing expulsion from the Ecuadorian Embassy in London within the next few days and President Moreno of Ecuador will be in Washington DC on April 16, 2019. Julian Assange as purported by the Democrats is the key to Russian Collusion but everyone knows that tale or assertion cannot stick. Julian Assange has NEVER worked for any government and has NEVER published or released information not verified. For many Americans he may be the key to the murder of Seth Rich and for the US Government to finally determine who gave them the treasure trove of emails that showcased and exposed many ugly faces of power players in and involved in US Politics. The DNC emails, Clinton emails and Podesta emails clearly demonstrated collusion of the previous administration and the Clinton campaign to control narratives, gross references to parties with children for entertainment, manhandling of classified information and discussions of insurance policies. The going narrative is that the INA papers implicating President Moreno are why Ecuador is discussing expulsion terms as WikiLeaks tweeted out. Notably, President Trump has delayed declassifying the FISA warrant applications and providing an unredacted Mueller report. This move can be interpreted as a way of protecting the integrity of UK elections and the volatile position they are in as the #NODEALBREXIT deadline looms. Exposing the collusion of the Obama administration with UK government entities which are concealed under redacted portions in the FISA warrant applications, could be detrimental to the UK’s Domestic Affairs and the UK’s Foreign Policy. As an American citizen and voter I have to say that holding the UK accountable for their actions in interfering in OUR elections, actions to usurp our democratic process, contribute to the Russia Hoax and assist a coup against a duly elected President of my country is imperative. Though, I believe that there is a time for everything and that time is near but not just yet. We have to be better than “them”. In my assessment, if Mr. Assange were to be expelled from the Embassy of Ecuador, he is likely to be arrested by British authorities and extradited to the United States..
Mitigation for the inevitable? For a very long time no countries have voiced any concerns of Assange’s rights. In fact they have constantly found ways to target him and exercise pressure against Ecuador for providing him asylum. Why the concern all of a sudden? Ecuador had discussed expulsion before? I am currently preparing a formal request to the Governments of Ecuador and the United Kingdom to carry out an on-site visit to Mr. Assange, and to meet with the relevant authorities of both States in order to assess the situation and risks faced by Mr. Assange in light of the universal and absolute prohibition of torture and other cruel, inhuman or degrading treatment or punishment. Extradition without due process safeguards, including an individual risk assessment and adequate protection measures violates international law, particularly if the destination State practices the death penalty and has not disclosed the criminal charges held against the person concerned. Under such circumstances, the international legal prohibition of ‘refoulement’ is absolute, regardless of considerations of national security, political expediency or any other similar considerations. 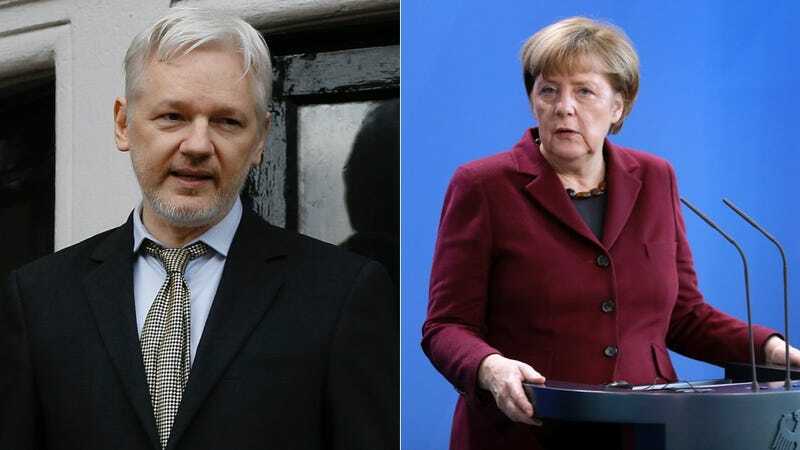 Angela Merkel has expressed her concerns on Assange and this week has met with world leaders including former Barack Hussein Obama on the matter of Brexit. It’s as if they are mitigating something huge. Merkel also said the E.U. will do everything it can to prevent a no-deal Brexit and expressed concerns of Assange expulsion discussions. The Germans claim this is a routine meeting and BHO meeting behind closed doors with Merkel is normal. 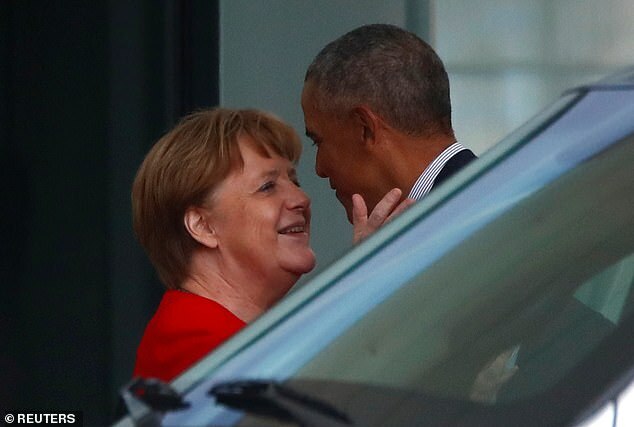 Merkel and Obama have already met in Berlin since the former president left office, participating in a discussion at a May 2017 conference where he again purported to introduce and applaud socialized ideologies such universal healthcare and migrant acceptance. His speech today was the same only rambling and showing that he was never about freedom and all about control. These meetings and discussion while EU is literally on fire, in turmoil and various member states implementing martial law paint a picture of mitigation that a former President of the United States facing possible retroactive impeachment for his direct involvement on election meddling and insurance policies on President Donald J. Trump should not be doing. BHO told Europeans to take to social media advising them on a range of topics such as tolerance for the huge influx of refugees and the benefits of socialism showcasing capitalism as an evil to an obedient society. “We also know that powerful forces are working to reverse many of these trends” said BHO in a battle cry to his audience. Yes, there are powerful forces seeking to reverse socialism across the globe. It’s the people who had so blindly and carelessly forfeited their rights to freedom taking them back! His visit can be interpreted as ELECTION MEDDLING. Brexit and EU Elections are happening within the next 60 days. This could possibly be why the Trump Administration hasn’t released FISA warrant applications and the Mueller report. Indeed the people of the UK and the EU have the right to know how their countries are implicated but the vicious FAKE NEWS MSM would blame President Trump for the EU failing when they are failing all on their own just fine. No need to give them any excuses right? For the next 10 days we have Brexit, Assange expulsion and President Moreno the talk of Washington, DC. The Democrats are forcing the administration to release the unredacted Mueller report and FISA applications. If they force the President I guess the MSM would find it hard to blame President Trump for UK and EU elections meddling … after all they are advocating for those releases too. Interestingly President Moreno will be in Washington DC on April 16, 2019. The Dialogue is pleased to welcome President Moreno, who will discuss how his administration is addressing a variety of major challenges, including boosting the economy, fostering greater social development, strengthening human rights, protecting the environment, and improving the inter-American system. No official announcement of President Trump meeting with President Moreno has been announced but he’s in the USA, why not? The next TEN days will be very telling. ← Where is Sec. Nielsen while Sen. Merkley Obsesses over Unaccompanied Minors?